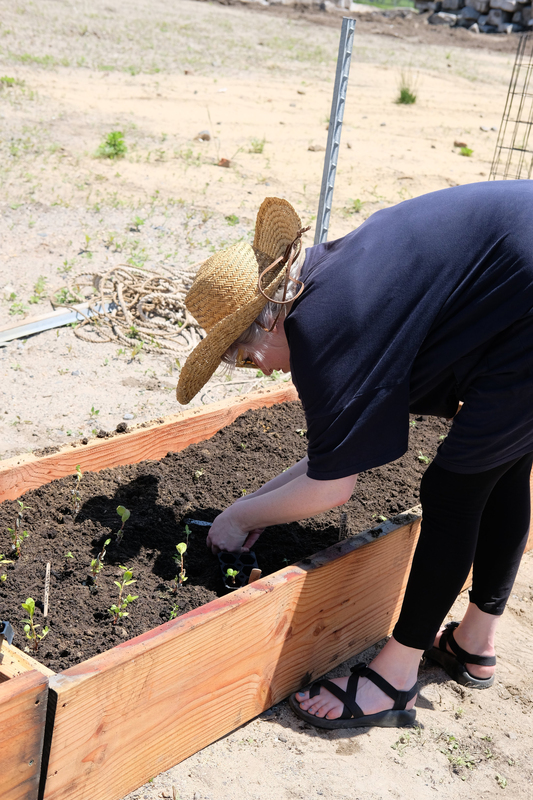 Sarah Pettitt planting home-grown indigo into Teaching Garden soil, May 21, 2018. Through Crowd-Seeded New York Indigo Farm, institutions and individuals collaborate to revive propagation of indigo. Tropical indigo was a former Southern cash crop. Critiquing historical narratives around Eliza Lucas Pinckney, heralded a feminist and mother of indigo, I sought to embody the labor intensity of indigo propagation and pigment extraction to heighten awareness of the enslaved laborers who made this unlikely process profitable. This performance of empathy relied on the participation of many collaborators, including the Brooklyn Botanic Garden’s Education Greenhouse, which germinated hundreds of seeds, and individuals all over NYC, who planted seeds on windowsills and backyards, and transplanted buds to Wyckoff Farm and GrowNYC’s Teaching Garden. Collaborator, Sarah Pettitt pictured. Photograph by Alan H. Hsu.